We don't get much traffic to our website, and we don't want to spend a lot of time on it. We focus our business on our users and our apps. For example, we just integrated AppsFire's AppBooster SDK into Picross HD so users can contact us and we can communicate with them directly within the App. I plan on writing a blog post just about it. So far the results are looking promising. However, you have to have a website. While we could hand code HTML, we ended up using iWeb. Our pages are mostly static, and we wanted something that was fast to create and gives us creative control (not ridged templates). 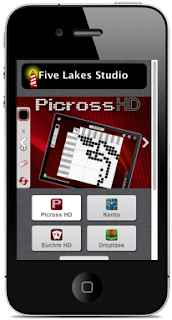 When we first launched Euchre HD we had some user complaints because they didn't understand how to setup Game Center. I was able to quickly (minutes) create and post visual step by step instructions on how to do this by using iWeb and Snagit. The downside with iWeb is it doesn't help with the creation of a mobile website, and the HTML produced isn't well suited for mobile. Also, I'm not sure what the future of iWeb is going to be. I think it is an amazing tool and I wish Apple was doing more with it. I started searching for a mobile website creation tool. I ended up finding an interesting online/hosted solution from dudamobile.com. They have an ad supported model and a paid model ($9.00/month). The paid model also supports connecting to your domain so now we have m.fivelakesstudio.com. Its very easy to get started. 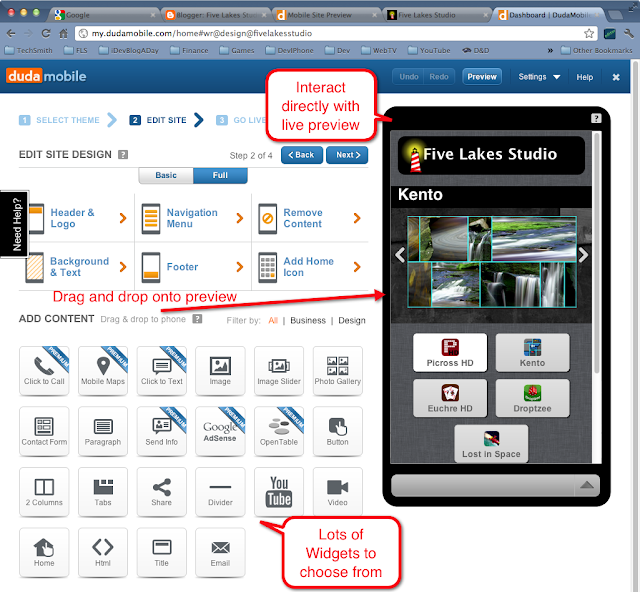 Dudamobile walks you through setting up a new site. You can pick from several themes. The nice thing is you aren't locked into a theme. During editing you can customize the page headers, footers, background, colors, layout, and so much more. My favorite widget is the Image Slider. You can add up to 3 images in a slider style control. You can see it above in the preview (currently showing Kento). One of the nice things about dudamobile is that it can import and sync to your existing website. When you add a page, you can give it the URL to one of your existing pages. It will then important the page. I was surprised this even worked for iWeb sites. I did have to do some basic cleanup and reformatting on the imported content. It was mostly deleting extra stuff I didn't want in the mobile site. I haven't tried syncing content. Most of the content we have is fairly static so I turned it off. Plus I am doubtful syncing will work well with iWeb, but I might be surprised again. I was impressed with the dudamobile support staff. I had some issues getting the slider to work the way I wanted. They where very responsive and helpful. It has only been live for about a week and so far I am pleased with how this turned out. I still need to setup redirects on all the web pages to redirect to the mobile website. Currently, only the main page has a redirect. 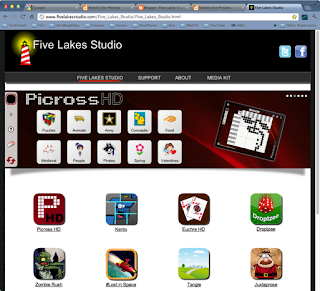 Please feel free to follow me on twitter at @fivelakesstudio. I would love to hear how others have solved their mobile website needs. I hope this was useful. Please visit our site and try out our games for iOS. Have you considered looking into a responsive design template for your blog? I see you are using blogger - I believe they created "Dynamic Views" for this. It's increasingly easy to find responsive design templates for any blogging CMS. The idea of managing a website and mobile site separately and managing redirect links is a headache of the past with this strategy. Instead, your content resizes appropriately for the window using the powers of CSS. Thanks Kyle. I hadn't looked into responsive design templates before. I found this little explanation on design modo http://designmodo.com/responsive-templates-frameworks. I will have to check it out. Thanks for the feedback. If you are looking into mobile sites you have to check out http://mofuse.com which offer many of the Google features and more with great integration with existing sites and brands. Thank you for sharing. With the number of people who own smart phones and tablets increasing, mobile website design is vital for your business! This is the first time I am visiting your blog. I found so many interesting stuff in your blog especially its discussion. Hey there this is an amazing write-up. I’m going to e-mail this to my close friends.